My goodness, I feel the Sewaholic Pattern love - I am sorry I can only choose one winner, although I am thrilled for Tasia and her popular new pattern! 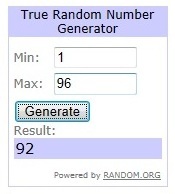 Taking into account the duplicate entries and one rogue spam comment, there were 96 entries. Without further ado, the winner is Christina! I am incredibly jealous of her rayon with bows and polka dots – sounds like perfection. Please contact me with your seam binding color choice at lauramae.p.s [at] gmail [dot] com so I can get your goodies in the mail. I loved hearing what everyone is working on in the New Year! I am knitting these days, since the light bulb died in my sewing room – it is some strange tubular contraption, and I have not had a chance to get to the hardware store. With darkness arriving soon after 5:00 p.m. there has not been very much I can accomplish in that room. And, to be honest, in this chilly weather, knitting suits me just fine! I've randomly got it in me to do some knitting as well! It's so much more portable than sewing. Congratulations Christina..... I am sure you will put it to very good use!! !